I can't believe that it's been 3 months since I started this Project Pan, if you want to read my Intro and 1 Month Update you can see my progress throughout this project. I am happy with my use of this product as I only thought I would use half of it in the 2 months. I enjoy using it as it makes my dry feet feel a little more moisturised. I hope to use this up in the next month or so. I started using this to remove my makeup so I have been using a lot more product everyday than I usually did. It is ok at removing makeup but doesn't remove waterproof makeup completely. I hope to use this up in the next month or so. I haven't used this at all in the past month as I completely forget about it. Since Summer is over, I don't think I will be using it as much but hopefully in Spring, I'll use it more. I have been using this everyday for school. I have definitely made progress in it as the embelishment has started to fade in the middle. It is going to take me a while to use it as I don't really like it. For a blush it contains a lot of glitter, I hope to try out a few different ways to use it. Like I said in the first Intro, I hope to just hit pan. I keep forgetting to use this. I'm not really a lipgloss person, I could say that's my excuse but I think another reason is that I put three lip products into this Project Pan instead of concentrating on one. I have only worn this once or twice since the start of the Project. I hope that I'll end up using it up eventually. I have been using this a lot which has helped me use it up but I also dropped it twice, oops! I repressed it so there's still a little more left to use up. I used to contour with it but then I realised to was very orangey on my skin so I have been using it to bronze up my face. I have enjoyed using this product but I am glad that it is nearly finished. This is another product I wear everyday to school and I feel like I can't see any progress what so ever. I find they are ok to use as a lip tint but I don't find them moisturising at all. It's hard to believe that I have to for nearly three years and I still only used a quarter of it. I thought I would have used this up really quickly but I was wrong. I fell like now since it is autumn I can wear it a bit more as I personally think it is more of a Autumn/Winter colour than Summer. I hope to use this up in the next few months. I'm really surprised how long this took me to use up, I thought since I was using it to remove a full face of makeup. At first I didn't like using it as I was never on the band wagon of using micellar water but I found it so convenient and it removed every speck of makeup. I am definitely going to look into getting a cruelty free one soon. I got through this very quick as I normally forget to put on body lotion, I didn't have high expectations from it as it was from Primark and I'm glad as it was ok. The body lotion was incredible thin, I didn't really like, but it absorbed quickly. I felt like it didn't do much for my skin and I'm glad I have used it up. My hatred for face wipes are real, I personally don't like using them on my face as I think they just move arounf your makeup a bit. I have been using them to spot clean my makeup brushes between washing. I found that using them in this way helped to use them up quicker. I have 2 more packets of face wipes to use up. One down, two to go! I kept forgetting to use this, it would always hide on my dresser and I would forget about it. I'm glad I can get rid of it now. I felt like it did nothing for my under eye area as I thought it would help with my dark circles but that was not the case. I was surprised that the scent from this body wash didn't last at all. It smelt nice in the shower but once as I got out of the shower and dressed the scent was forgotten about. I liked using it but I was disappointed with the longevity of the product. 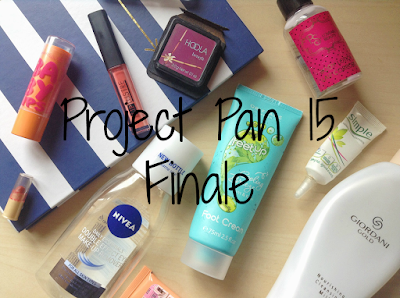 I have finished 7 products in total in this Project Pan and I am happy for the outcome. Hopefully I'll get the rest finished in the next month or two. I have decided that I am going to merge this series with my Empties series, I feel that if I do one, the other one lacks a bit.